Topics: Plumbing Repairs, Toilets, Bathroom Plumbing, Kitchen Plumbing, and Water Heaters. 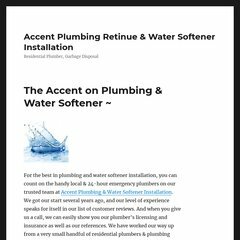 accent-plumbing.com Normal Household Items That Can Lead to Clogged Drains | Accent ..
accent-plumbing.com What to Do If You Smell Natural Gas in Your Home| Accent Plumbing ..
accent-plumbing.com 10 Ways to Remove Limescale | Accent Plumbing, providing Online ..
12 users visit the site each day, each viewing 2.00 pages. Its 2 nameservers are ns0.denhamdomains.com, and ns1.denhamdomains.com. Theplanet.com Internet Services Inc (Texas, Houston) is the location of the Apache/2 server. The site is programmed for PHP/5.2.14. PING (74.53.52.213) 56(84) bytes of data. A ping to the server is timed at 55.7 ms.